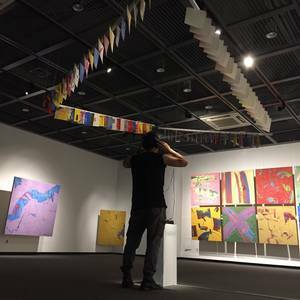 I am a Korean artist working in painting, drawing, printmaking and making objects. I usually explore my inside things ever changing (feeling, emotion, thought, idea so on) through documenting records of my hand unconscious action. In a part my art is inspired by a Korean artist working in US, Ik-joong Kang, Ungno Lee; American artist Jean-Michel Basquiat and Cy Tombly. Also during my research in Ph.D, I have been inspired by my supervisors, Australian artists: professor David Thomas and Doctor Phil Edwards. Generally ideas and methodologies on my art works are based on traditional Korean art concept and sensation, plus Jungian idea of 'Natural Symbols', American action painting.